Free Download Tamil Nadu TRB Asst Professor Previous Papers pdf files are available here. Therefore, the applicants can download this Tamil Nadu Teacher Model Question Papers pdf. Also, you can check at the official site Tamilnadu Teacher Recruitment Board, i.e., trb.tn.nic.in for more details about the Assistant Professor exam. Hence, download the Previous Papers of TRB Assistant Professor Exam at free of cost from the following links. Refer the home page to get Previous Papers. Tamil Nadu Teacher Previous Question Papers free downloading links are available below. These attachments are helpful for the applied people of Teacher Recruitment Board Asst Professor jobs. We are presenting plenty of TRB Assistant Professor Old Papers for practicing purpose. In addition to the TN Teacher Previous Papers, we are also providing answers for them. Hence the aspirants can get the Asst Prof Solved Question Papers along with the answer key. So, do more practice with those TRB Model Papers. You will acquire good marks in the final exam. Also, aspirants can get the free downloading links of Tamil Nadu Assistant Professor Old Year Question Papers. You may also refer the Official site for additional information. 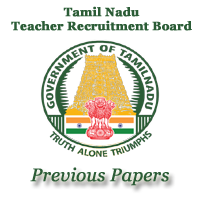 Name of Recruitment Board Teacher Recruitment Board Tamil Nadu. Name of the Posts Assistant Professor Posts. Total Number of Vacant Posts 1111 Vacant Posts. Exam Loaction Tamil Nadu, India. Start Date to submit the application 10th March 2017. Last Date to submit the application 20th March 2017. Job Category Tamil Nadu State Government Jobs. Recently, the Teacher Recruitment Board of TN has issued the recruitment notification for Asst Professor jobs. The notification is published for the Teacher jobs in Tamil Nadu Engineering Colleges. Aspirants who are exploring for the Teaching Jobs can apply for these jobs. The Tamil Nadu TRB invites the applications from the aspirants to fill up 1111 vacant posts. People who are looking for the Tamil Nadu State Govt Jobs. The individuals can use this golden opportunity. Applicants may check the official announcement notification of TN Teacher Recruitment Board Recruitment Notification 2017 for furthermore details. The further details concerning Eligibility, Educational Qualification, Age Limit, etc. are given in the official notification. We are presenting you with the Latest Govt Jobs Exam Papers on our site. The interested and eligible individuals may apply for this Tamil Nadu Assistant Professor Jobs before the last date, i.e., 20th March 2017. Teacher Recruitment Board Asst Prof Exam Pattern is provided here. First of all, applied aspirants must know the syllabus and test pattern before going to begin their preparation. Hence, candidates can check the TRB Asst Professor paper pattern on our page. Download the TN TRB Old Question Papers for free of cost and within few seconds. Free downloading attachments of Teacher Recruitment Board Asst Professor Previous Papers are given below. So the aspirants can start their practicing by viewing the exact exam pattern and syllabus details. Individuals can also have a look on the TRB Asst Prof Exam Papers. We are also providing Tamil Nadu Asst Professor Sample Question Papers PDF below. For more information, refer official website. Check the TNTRB Asst Professor Exam Pattern in the below table. The Teacher Recruitment Board Asst Professor exam is an objective type exam. Questions of this exam are from GK and Concerned subjects. The no of questions in this exam is 150 questions. The Overall marks for the TRBTN Assistant Professor written test are 190 Marks. And the exam duration of this Asst Prof exam is 3 Hours. The above table describes the TRB Assistant Professor Test pattern details. In this, you can know the duration of exam, the no of questions, subject names, type of exam and also the total marks. Applicants can see the test pattern that is helpful in their preparation. People can also visit the official site. Also, we are giving the TRB Asst Professor Previous Papers here. The subject wise previous papers of TNTRB Assistant Professor Exam Papers of 2010, 2011, 2012, 2013, 2014, 2015, 2016 are present below. Aspirants who are hunting for TRB Asst Professor Previous Papers can get them for free of cost. Here we are attaching the topic wise papers. So the individuals can get the Teacher Recruitment Board Old Question Papers by clicking the following links. Applicants require solving the plenty of TRB Teacher Solved Question Papers to obtain a good percentage of marks. Download TRB Asst Professor Previous Papers are provided below. Use these papers for your preparation as guidance. In addition to them, we are also giving answers for the TRB Assistant Professor Old Year Question Papers. Candidates can get these Asst Professor Sample Papers of TRB with answer key. So you can also get some Practice Papers of Tamil Nadu Teacher Exam. For further more details, people can go to the official website.